Our village pub had quite a lot of fruit trees in the garden. The new owners, for reasons best known to themselves, decided that they didn't want any of them. They were going to be taken out and burned so the owner told Chris and our next door neighbour that they could help themselves. Most of them were too big to dig up and move but Chris managed to dig up four smallish ones. One is in the garden and three are in big pots waiting for a suitable spot in the garden to be prepared. We don't know what they all are but we're sure that this one is an apple tree. this is a delightful capture - and aren't they beautiful! How sad they were to be destroyed, thank goodness a few are saaved. 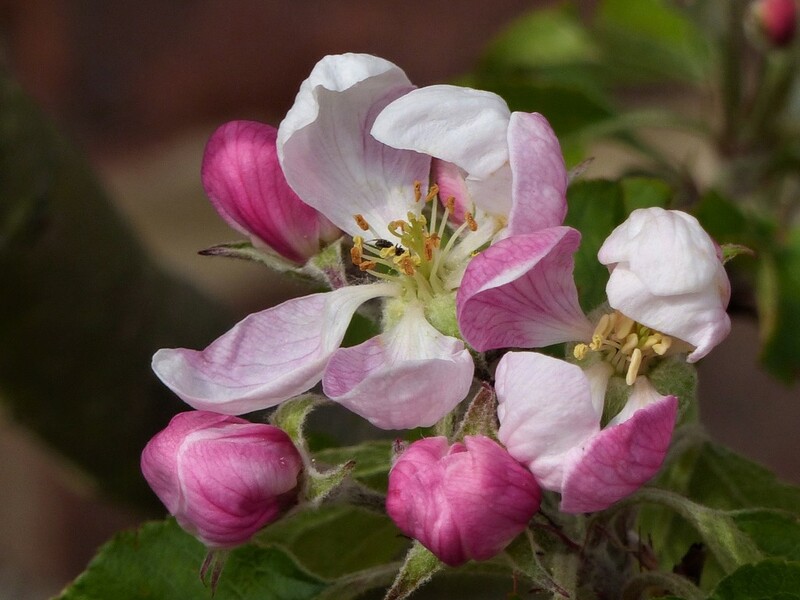 A fav for a super capture Such a beautiful Apple Blossom ! Isn't it wicked when people do not appreciate lovely fruit trees but hopefully you will benefit from their stupidity I suppose they want a super modern pub garden !! Apple blossom is so pretty! Nicely captured. I love apple blossom. Glad you could save a few fruit trees! Shame! Lovely shot and apple pies later!